Find the latest Tudor Branch Subdivision homes for sale in Grovetown, GA! 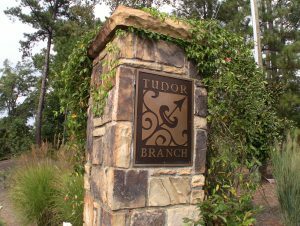 Read more about Tudor Branch Subdivision below. I'm available 7 days a week to set up a showing for any home for sale, no matter who the listing company is. Contact me today! Welcome to Tudor Branch subdivision! Tudor Branch is one of a few neighborhoods in Augusta to have a greenspace buffer. This buffer is a 140 acre nature preserve that serves as a permanent greenspace buffer for the neighborhood. Tudor Branch Subdivision is a gorgeous well kept neighborhood in Grovetown GA, just off of Columbia Road. Easy access to Interstate 20, and near grocery shopping and restaurants. Tudor Branch is just minutes to Fort Gordon Gate 1 or Gate 2. Most subdivisions on the outer edge of Grovetown can reach Fort Gordon Gate 1 or Gate 2 within about 20 minutes on average. I have many happy families who have bought homes in Tudor Branch enjoying great appreciation in their homes. I can offer a wealth of valuable information for you if I'm assisting in your home buying experience. The community HOA website contains additional information about the subdivision including covenants (there are many so we provide a link instead). Chatsworth, Coleridge, Creekside, The Courtyards, and The Meadows. Some of the Tudor Branch homes for sale amenities are: Pool, Bike Path, Playground, Clubhouse, Walking Trail, Park, Sidewalks, and Street Lights. There are a mix of builders in Tudor Branch. One of my personal favorites in Tudor Branch is RT Bailey - he's an excellent builder who ranks high with home inspectors. Please call Mark Mulich, your new construction expert as your buyers agent. I will get you any information you want so you can decide which builder, house plan and new home community suits you and your family the best. I will give you objective information about the pros and cons and work as your new construction buyer’s agent at no cost to you! Pricing, floor plan, features and availability in Tudor Branch are subject to change without notice. Heated Square Foot is approximate. All information deemed accurate but not guaranteed, buyer is responsible for verifying all information. For example, some photos or floor plans shown are of previously built homes and exteriors.